Yu-Gi-Oh! becomes the sixth manga universe to join Jump Force! Are you ready to duel? Bandai Namco have today confirmed that Yu-Gi-Oh! will be featuring in Jump Force! 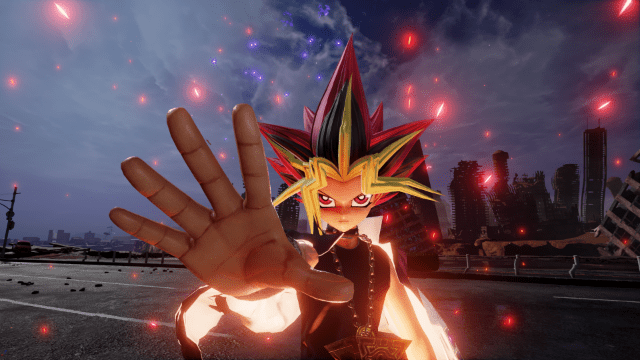 Set to release on Xbox One, PS4 and PC in 2019, Jump Force players will now also be able to utilise the power of Yugi Muto, the hero of Yu-Gi-Oh!. With yet another manga universe confirmed for action, this ensures that the heroes and villains roster from the 50 year history of Shueisha’s influential Japanese manga Weekly Shonen Jump increases yet again in Jump Force. For those unaware, Yu-Gi-Oh!’s story takes place in a world where a card game: Duel Monsters, is one of the largest aspects of everyday life. The game can bring fortune and fame to its champions, or demise to those less fortunate. Yugi Muto – the main protagonist – is a lonely boy who loves playing the game but was never blessed with talent. After finding and solving the Millennium Puzzle, an ancient and powerful artefact, Yugi unknowingly became host to Dark Yugi, the spirit of the long deceased Pharaoh Atem. The Pharaoh’s spirit possess and takes control of Yugi in times of danger, he is able to become one of the greatest Duel Monsters players in the world. Does the arrival of Yu-Gi-Oh! seal the Jump Force deal for you? Let us know in the comments below.